Take a little escape on the Escarpment Route in Mpumalanga, a specific section of the greater Panorama Route. Buckle up and head out on the road of the ‘land of the rising sun’ with a journey departure timed with the sunrise. An early start ensures that all of the thirty plus points of interest that fall on this stretch of tar and occasional dirt road, can be ticked off your “to-see” list by the time the colours of dusk take hold of the heavens and the sight in the rear-view mirror takes hold of your contentment. Mother Nature makes grand gestures of rock and water amongst pockets of plains and indigenous plant life all along the drive. This spectacular excursion commences with a splash at Mac Mac Pools perfected with an accompanying daybreak picnic to be enjoyed waterside. Next stop an impressive plunge where the pouring of morning coffee cascades from a flask into a camping cup to mimic a mini Mac Mac Falls; in combination an unusual drive-through Mac breakfast on the natural side. One fresh fall leads to another with a stop at Maria Shires Falls and Graves followed by Forest Falls and a forest walk between the pines. Look up at the trees and later look down at local history laid out on the floor of Diggers and Transport Riders Memorial. Drift between scents carried on invisible clouds at the Herb Farm en route. Next on nature’s treasure hunt curios stands mark the place to park to cross the Natural Bridge and then a hop, skip and a jump links visitors to the town of Graskop where cocoons and silk worms take to the stage at Tsinini Silk Weavery to demonstrate the art of weaving. Cool off an afternoon with a gorge swim at Panorama Falls; a gaze a Pinnacle Rock and a peep through God’s Window. The highest escarpment viewpoint of Wonder View can be complimented on an itinerary with the highest waterfall in the escarpment, Lisbon Falls. Take in Berlin Falls and some more fresh air and then view an author’s place of rest at Oswald Pirow’s Grave. 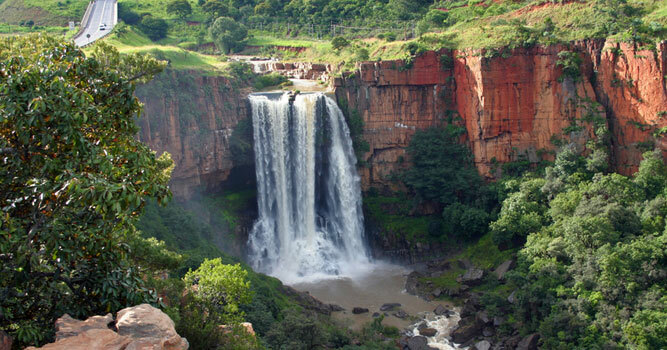 Toss a coin into Bourke’s Luck Potholes, cast a gaze at Lowveld View and count the humps from the view of the Three Rondavels. 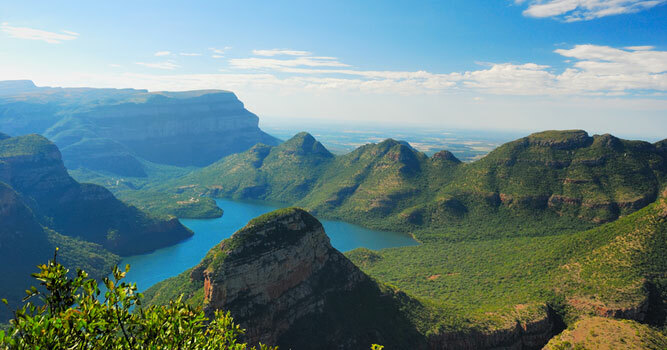 The Blyde River Canyon opens up a view of the third largest canyon in the world. Museum of Man opens up an outdoor amphitheatre of history leading to the location of Echo Caves. A full day of escarpment sight seeing and visual experiences is finally laid to rest at the Voortrekker Fort and Cemetery. Drive from Sabie: R532 to Graskop. From Graskop: Follow R532 for 2 km. Turn off on R534 circular road back towards R532. Drive on R532 north towards Ohrigstad. From Ohrigstad return via Lydenburg on R36 or via Pilgrim’s Rest on R533. Bottom photograph taken at the Blyde River Canyon.